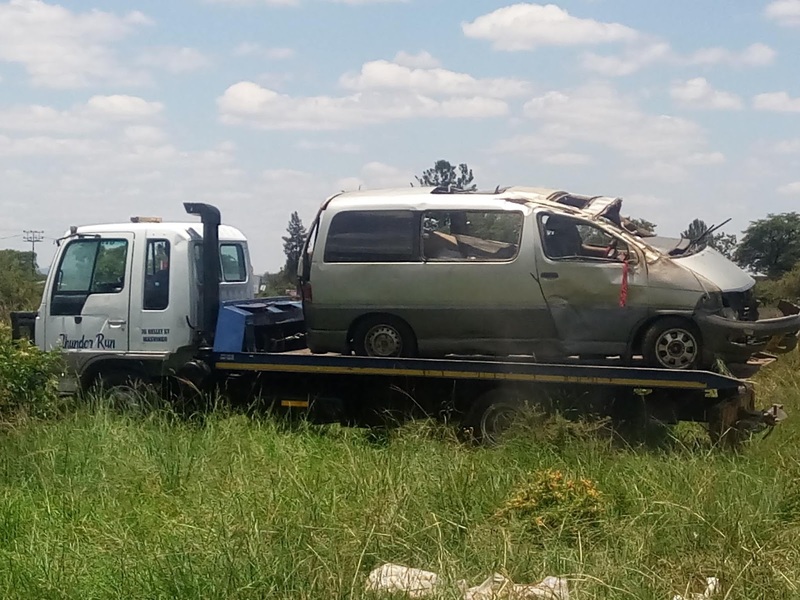 MASVINGO- Two people have been killed including the driver after the Toyota Regius they were travelling in veered off the road and overturned seven times throwing out all the passengers before landing on its roof at Puma Clipsham Service Station (Wimpy) along Masvingo-Beitbridge Highway. One person died on the spot while the other died on the way to Masvingo Provincial Hospital. 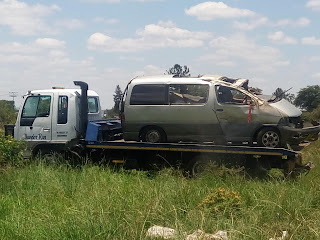 Masvingo Police spokesperson Chief Inspector Charity Mazula confirmed the accident, but could not disclose the names of the deceased as their next of kin had not been informed. Stan Chadenga a fuel attendant at Puma Clipsham told The Mirror that the driver was speeding and he lost control of his vehicle and it started spinning for almost 7 times. “The vehicle had 4 people on board and all of them including the driver were thrown out of the vehicle and we could not tell who was driving the car,” said Chadenga. “Mars arrived 30 minutes after the accident while other ambulances and the Police arrived at the scene 45 minutes later, if they had arrived earlier, maybe those who died could have been saved,” said Peter Chisvo who also witnessed the accident. Sources told The Mirror that the driver pirates from Bhuka to Masvingo and he mostly ferries vendors. “The driver is from Bhuka and he usually ferries vendors to Masvingo, that’s why you can see all the cooked mealies on the ground which are still hot,” said an eye witness who spoke on condition of anonymity. The two who were injured are admitted at Masvingo Provincial Hospital and their condition is critical.